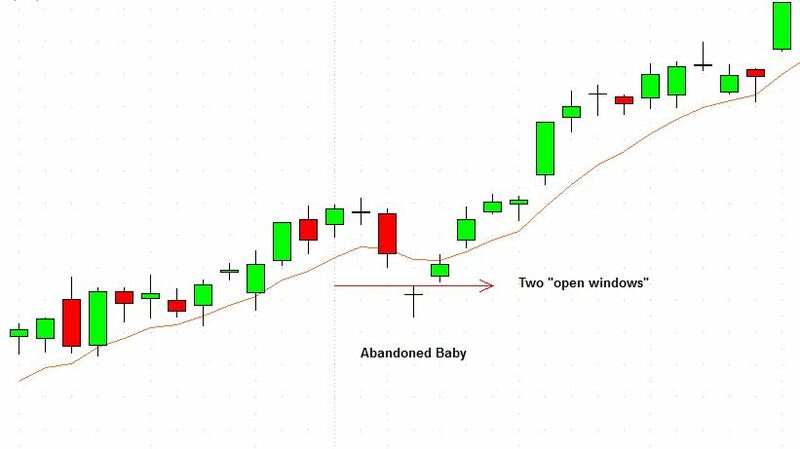 An Abandoned Baby Bottom is a rare bullish three bar reversal pattern that develops after a down leg. This pattern begins with a down gap followed by a Doji or similar smaller candlestick. An up gap then occurs on the next bar leaving the doji "abandoned" at the low. In the classic version of this pattern, the doji bar shadows are completely below the shadows of the first and third bars of this candlestick pattern. The two gaps in this pattern are often called "open windows." 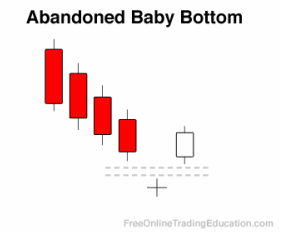 Technical analysts often use Abandoned Baby Bottoms as a buy signal. Additional confirmation in the form of a bullish tradable setup is often needed before the trader will open a long position.